Dynamic Lights Mod 1.10.2/1.7.10 is an useful mod in Minecraft that makes exploring caves easier and adds a few brilliant touches with Minecraft’s lighting system. When holding a torch, glowstone, etc. it will light up the surrounding area. Similarly, if you throw the lit item it will still light up the area. On top of that, burning Entities (Creatures, Items) shine light. You may also configure whether an item still shines if in water, and how long it shines once you hold or drop it. 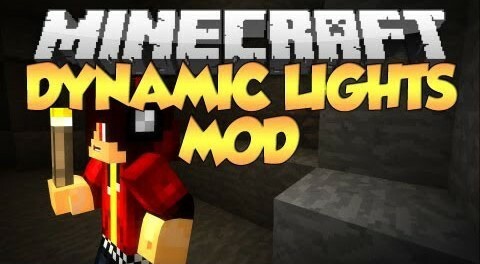 There is no limit to the number of lights you can create, note however they are fairly FPS-costly, and the mod will attempt to reduce lighting render updates frequency if you overdo it. I recommend using Optifine HD for replacing Notch’s funky render code with slightly less funky rendering code. Optifine should maintain full Dynamic Lights compatibility unless i break it. To remove modules you dont want or cant afford (your machine is an asthmatic train wreck, or a Mac), simply remove (delete) them from the mod .jar /atomicstryker/dynamiclights/client/modules folder. Yes, the mod will continue to work. If you delete all modules, the mod won’t do anything.